oogle makeup: The secret to being wrinkle free? Yes, apparently new research funded by Olay and printed in the June issue of the British Journal of Dermatology has shown that moisturisers are the key – women with well-hydrated faces tend to develop persistent wrinkles more slowly than those with dry skin. The Proctor & Gamble funded study traces the key between facial expressions and wrinkles. The results showed that an average 28 year old woman with dry skin would have increased the amount of visible wrinkles by 52% by the time she reached 36. However if she had well-hydrated skin, the visible wrinkles would have increased by just 22% over the same time frame. In short, the state of their skin at 28 dictated the rate they would age and "was predicted by the pattern of lines observed with a smiling expression at baseline." The concept of oily skin and the link between moisturising and ageing is nothing new: "Ageing is all about moisture loss. As skin cells grow older, they lose their ability to keep in moisture and this results in drier skin and the appearance of lines and wrinkles. Dry skin is brittle and cannot hold its shape fully during daily movement. Hydrated skin is much more flexible and able to crease without permanently changing superficially. This is why anti-ageing creams are all based on the moisturising principle." But the link between dry skin and wrinkles had never been investigated until this study established that repeated facial expression caused persistent wrinkles - which can only be softened by moisturising well in advance. This information hardly seems groundbreaking, the term "laughter lines" has been around a while, after all. But having it all in black and white, even if it is sponsored by an Olay moisturiser, means that there really is no excuse to not moisturise well in advance of your thirties. 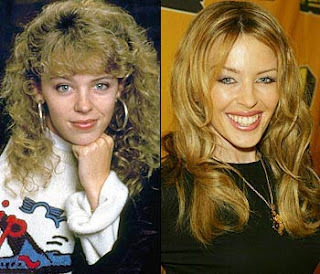 As if to corroborate this evidence, Kylie Minogue has sensationally revealed that she has turned her back on the botox and similar treatments which have preserved her youth. Perhaps because botox supposedly causes its own wrinkles. Instead, her secret is nothing more than a humble jar of Ponds Cold cream. Next week: Simon Cowell reveals his mega watt smile is down to Colgate. I use RoC retinol cream and it has reduced the fine lines around my eyes and plumped my skin. So I am definitely a believer in retinoids. But not all non-prescription retinols work. Recently I switched to Estee Lauder Night Repair and the wrinkles reappeared after about a month. Maybe it doesn't have enough of the active ingredient? RoC has AHAs too; I don't know if that makes a difference. I've never tried prescription retinoids but I am considering Retin-A. Ha! I never knew about the Bunny Lines. Too funny! Luckily, even in my late 30's my skin is still oily. I try to mattify it everyday but I suppose when it does breakthrough I shouldn't groan so much and just be grateful that it may reduce future wrinkles. I agree about your thoughts on the study - if I understand you - there is nothing groundbreaking but did it at all mention using SPFs? Also, I find it difficult to accept any findings that was initiated AND funded by a cosmestics brand and its' parent company. Yea right, no bias going on there! Thanks, yes oily skin is a mixed blessing I suppose...!